Bank House01553 660492work01553 765226fax HotelOur beautiful bedrooms are each individually decorated with high quality beds and crisp white linen, flat screen television, radio and tea and coffee making facilities. Many rooms have river views. Luxury bathrooms have fluffy white towels and Molton Brown toiletries. We love food at Bank House and are very proud of the exciting, reasonably priced food in our elegant, relaxed Brasserie, once the Bank's Counting House. 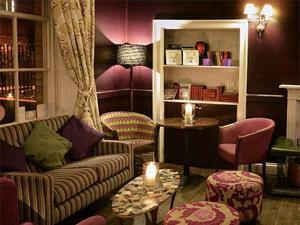 The Bar, situated in what used to be the Bank Manager's office, is a great place to relax and meet with friends. Bank House has a tremendous history. Originally the home of a rich Lynn wine merchant, Joseph Gurney opened his first bank in the house in the 18th century, the bank that went on to become Barclays Bank. Bank House has a west facing riverside terrace, just the place for relaxing with a drink at sunset. Bank House offers a stylish and relaxing base for a visit to historic King's Lynn and the glories of North Norfolk. Sandringham House and Houghton Hall are just a short drive away, as are the wonderful north Coast beaches and bird reserves of Snettisham and Titchwell. Our beautiful bedrooms are each individually decorated with high quality beds and crisp white linen, flat screen television, radio and tea and coffee making facilities. Many rooms have river views. Luxury bathrooms have fluffy white towels and Molton Brown toiletries. Bank House is sister hotel to the award winning Rose & Crown in Snettisham. From Midlands, Norwich & South - if on A10, or A47 (from Norwich), you come to huge roundabout with traffic lights. Follow signs to TC. Come to small roundabout. Go through old town gates, into London Rd, towards TC. At 5th set of traffic lights (just past KFC) take left (signed 'South Quay' & 'Old Town'). Go down rd (the Millfleet) over set of traffic lights until mini-roundabout. Turn left here. There are regular trains from King's Cross, London. Then taxi to house.